Blue jays are common visitors to winter feeders as they are among the birds who do not migrate south in colder months. Not every bird heads south for the winter. In fact, hundreds of species and varieties of songbirds stick around in northern climates, riding out the winter often with a little help from non-feathered friends. It can be a lean time for birds, Leppold said, as cold weather and deep snowpack can limit access to natural foods upon which the birds rely. “During the winter supplemental feeding can help birds survive during really severe stretches of bad weather,” Leppold said. 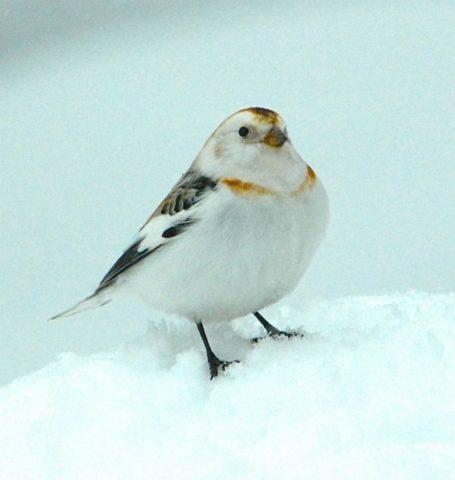 The most commonly sighted birds that stick around northern states in the winter are chickadees, bluejays, snow buntings, junkos, nuthatches, woodpeckers, titmice and song sparrows. Now is the time, according to Leppold, to prepare for the winter feeding by prepping food and water stations and stocking up on what birds like to eat. When it comes to winter bird feeding, forget spring cleaning. Fall is the time to get feeders spruced up. This, she said, will help reduce the transmission of diseases to and between birds. 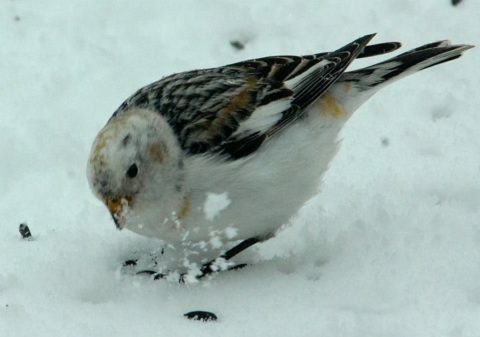 Snow buntings are ground feeders and can often be seen below bird feeders during the winter months helping themselves to the spilled food. Leppold recommends cleaning feeders once a month during the winter feeding season. Songbirds are not the tidiest of eaters and create a bit of a mess under feeders with spilled seed, husks and their own droppings. Different kinds of food will attract different birds, but one thing they all seem to agree upon is black oil sunflower seeds. Other food options are cracked corn, thistle seed, dried mealworms, unsalted peanuts and suet. Gardeners can save and dry seeds from pumpkins, squash, zucchinis and cucumbers to serve to the birds during the winter. Different types of feeders will attract different types of birds, according to Leppold. Wire-mesh tube feeders, for example, are perfect for birds that can cling like chickadees, woodpeckers or nuthatches who can grasp the the side of the feeder while selecting food. 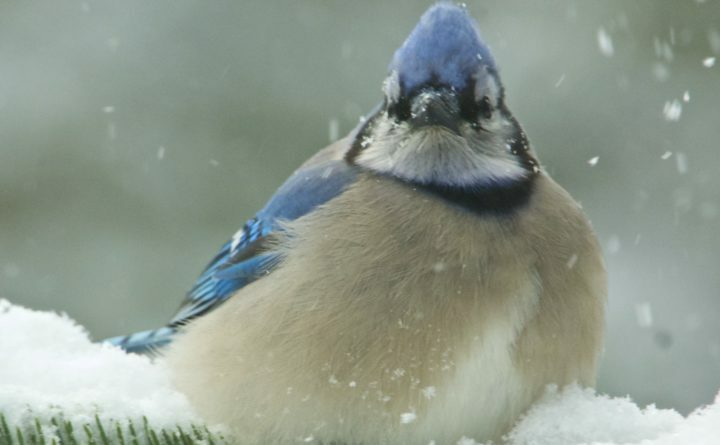 The design also prevents larger, non-clinging birds, like jays, from hogging all the feed. It’s also a good idea to provide a feeder stocked with suet made from animal fat. When the temperatures drop, water freezes and finding sources of open water becomes a bit of a challenge for over-wintering birds. Installation of a heated water source or bird bath can be a great help to these birds. Most songbirds do not need to drink a huge amount of water over the winter, as they obtain much of their hydration through their food, eating snow or drinking ice droplets. Even in the far north there are enough sources of open and running water for most of the birds, but the heated bird baths are a help to them and attract the birds for those who enjoy watching them. Once the food and water sources are set up, the only thing left to do is keep the food coming and sit back and enjoy the daily bird show.